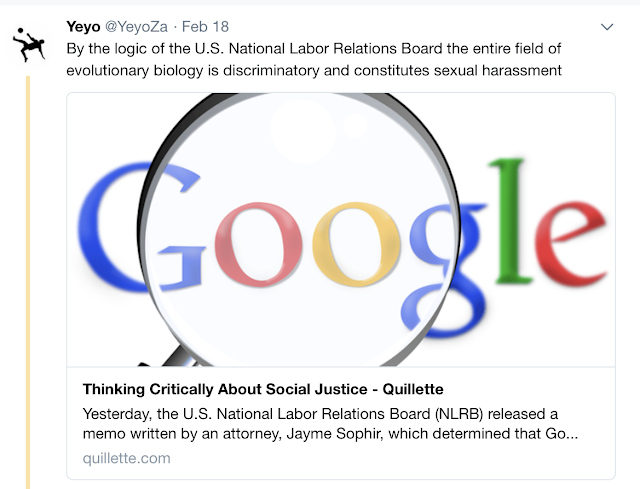 As far as the Quillette gang is concerned, evolutionary psychology - which they often conflate with evolutionary biology in order to paint skeptics as anti-science - contains The Absolute Truth about women and about non-whites. And anybody who doesn't go along 100% with the claims of people like Steven Pinker is in denial of human nature and - per Pinker - reality itself. Here we see another low-nutritional-value piece of work in Hackette: It’s Time for Evidence-Based Gender Policy written by Teresa Gimenez Barbat. We still don’t have a way to liberate political decision-making from ideologies, interests and emotions. I have been a member of the EU Parliament since November 2015, when I joined a liberal political group with a particular ideological orientation – ALDE – but for now there is no such thing as an autonomous intelligent robot doing the hard job for us. We have a bounded rationality and a political nature. This implies that political reasoning obviously does not operate from a “blank slate”, but in the context of the existing social institutions, constrained by a set of evolved adaptations, biases and inherited orientations that vary individually. I am persuaded that the Rights Revolution of the past few decades, including the fight for cultural delegitimization and legal prosecution of violence against women, carried out by the feminist movement, represents a clear example of moral progress. At the same time, I think a new “twist of the screw” is needed to include all the real victims – women, men, and children of both sexes – as Steven Pinker suggests in a chapter of his book The Better Angels of Our Nature. Let's look at what the New Yorker had to say about Better Angels. Elizabeth Kolbert wrote the review. Pinker names thinking itself as the ultimate pacifier. “One would expect that as collective rationality is honed over the ages, it will progressively whittle away at the shortsighted and hot-blooded impulses toward violence, and force us to treat a greater number of rational agents as we would have them treat us,” he writes. 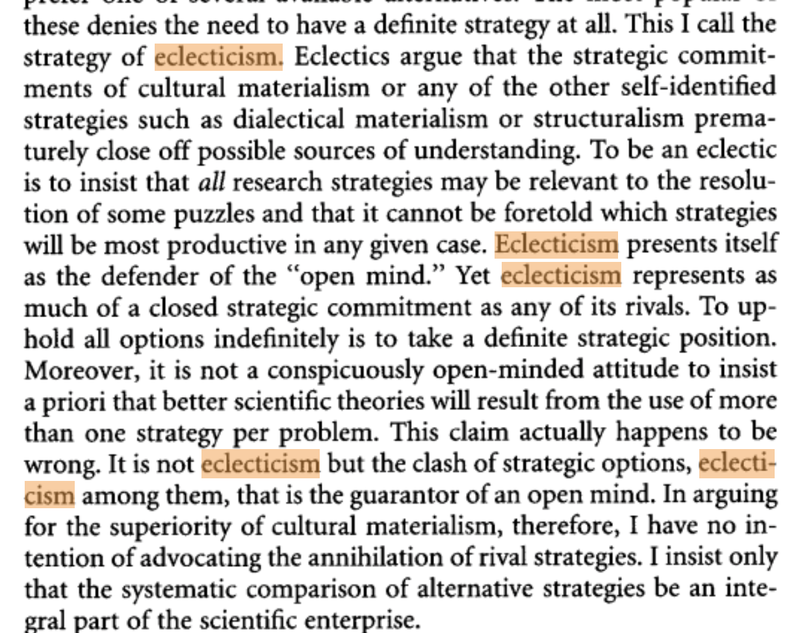 Both evolutionary psychology (aka sociobiology) and the belief that ideas drive behavior - "idealism" are what Marvin Harris called "research strategies" which he contrasted with his own approach to understanding human culture, "cultural materialism." The intuition that thought determines behavior arises from the limited temporal and cultural perspective of ordinary experience. Conscious thoughts in the form of plans and itineraries certainly help individuals and groups to find a path through the daily complexities of social life. But these plans and itineraries merely chart the selection of preexisting behavioral "mazeways." Even in the most permissive societies and the richest in alternative roles, the planned actions - lunch, a lovers' tryst, an evening at the theater - are never conjured up out of thin air but are drawn from the inventory of recurrent scenes characteristic of that particular culture. The issue of behavioral versus mental determinism is not a matter of whether the mind guides action, but whether the mind determines the selection of the inventory of culturally actionable thoughts. As Schopenhauer said, "We want what we will, but we don't will what we want." Thus the human intuition concerning the priority of thought over behavior is worth just about as much as our human intuition that the earth is flat. It took billions of years for natural selection to create specialized adaptations for fishing, hunting, agriculture; for aquatic terrestrial and aerial locomotion; and for predatory and defensive weaponry, such as teeth, claws, and armor. Equivalent specialities were developed by cultural evolution in less than ten thousand years. The main focus of human sociobiology ought therefore to be the explanation of why other species have such minuscule and insignificant cultural repertories and why humans alone have such gigantic and important ones. As I demonstrated yesterday, Steven Pinker has no qualms in The Blank Slate about claiming any cultural phenomenon, even artistic fashions can be explained through evolutionary psychology. But he seems to have given up using that as the only explanation in Better Angels. 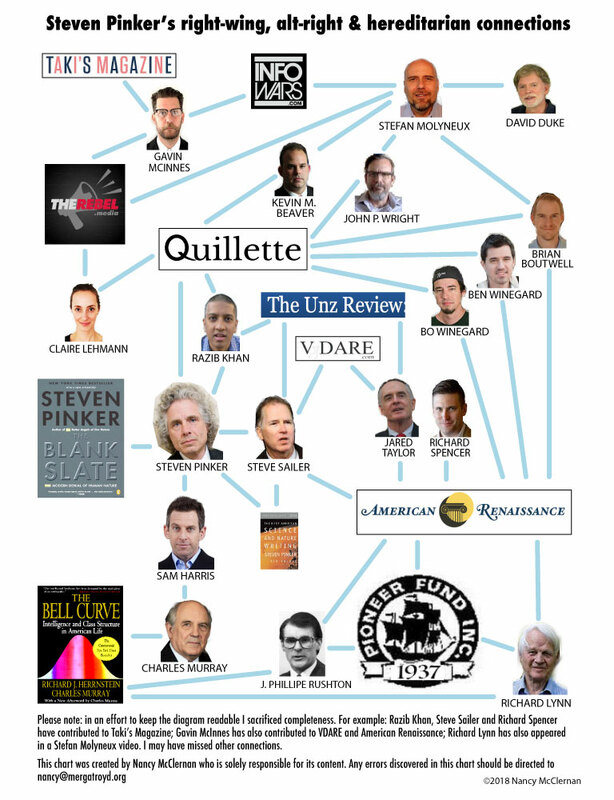 But Pinker is still a sociobiologist at heart. 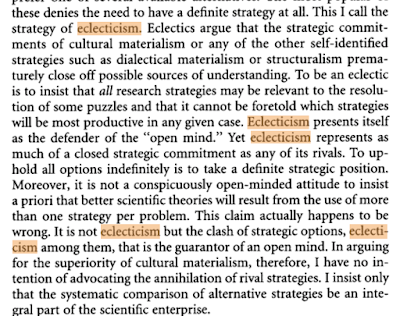 So he uses both sociobiology and idealism and switches up whenever he wants. I generally like the work of Marvin Harris because he advances clear and testable explanations, and I cite him favorably in several places in How the Mind Works. But his view of human nature is too narrow — everything boils down to calories. People have to eat, but they have to do other things as well, such as winning sexual and parenting partners, and that doesn’t fit into his one-dimensional, quasi-Marxist-materialist view of human nature. If he acknowledged that man does not live by bread alone, he would have contributed even more to anthropology. This is a pretty serious omission, both because of the scale of the slaughter and because of the way it troubles the distinction between savage and civilized. What does it reveal about the impulse control of the Spanish that, even as they were learning how to dispose of their body fluids more discreetly, they were systematically butchering the natives on two continents? Or about the humanitarianism of the British that, as they were turning away from such practices as drawing and quartering, they were shipping slaves across the Atlantic? And what does it say about the French that they liked to refer to their colonial project as la mission civilisatrice? This demonstrates how Pinker fails to have any kind of intelligible organizing principle - he just bops around talking about whatever he feels like talking about, so if he finds vegetarianism in Great Britain more interesting than how the Spanish treated indigenous Americans, well that's what he's going to talk about, regardless of the relative significance of each phenomenon to the history of violence. The result is that for all his words, Pinker provides no useful explanation for anything.